Species identification in the food of animal origin is an essential aspect of its control. Food safety and environmental forensic professionals in various countries are becoming increasingly concerned about the number of serious food offences being carried out by organised criminals. Adulteration in food especially meat is relevant for legal, economic, religious and public health reasons. This study aimed to determine potential adulteration and/or contamination with the donkey, chicken or even human tissues or cells in different marketed red meat products. The products tested were the uncooked beef burger, sausage, kofta and luncheon, manually processed or were of different commercial brands with variable prices, through a PCR-based method. A total of 40 different commercial meat product samples were randomly collected from restaurants, butchers, hypermarkets and local shops. The 12S rRNA region within the mitochondrial DNA was amplified with species-specific primers for identification of two suspected animal species (donkey and chicken) and two nuclear DNA STRs (short tandem repeats) loci, TPOX and D18S51 for excluding human origin of adulteration or contamination. The total beef samples analysed showed 87.5% adulteration and mislabelling with one or more species. They were mostly mixed with chicken meat or their by-products (72.5%) followed by donkey (12.5%) and lastly human (2.5%) that was detected in a manually prepared kofta sample. The used non-human species-specific PCR along with the first reported use of human hypervariable STRs proved valuable and straightforward techniques for species authentication of meat products. Species identification in the food of animal origin is an essential aspect of its control. Food adulteration—as a relatively common practice worldwide—is important for legal, economic, religious and public health or medical reasons (Mafra et al. 2008; Abbas et al. 2018). Processed meat refers to meat that has been transformed through salting, fermentation, drying, smoking or other processes to improve flavour or preservation, like hot dogs, sausages and luncheon (WHO 2015). Generally, adulteration in meat products encompasses the fraudulent deliberate substitution or addition of animal proteins of cheaper prices or plant proteins like soybean or mislabelling weights of actual constituents (Dooley et al. 2004). Unintentional cross-contamination through the use of shared equipment among different meat species or improper unhygienic human handling, all may add other sources of apparent adulteration in a meat product (Keyvan et al. 2017). Intended mixing of meat products with other animals’ meat other than declared have been reported in several countries including Egypt, such as the mixing of the donkey and dog meat instead of pure beef meat (Zahran and Hagag 2015) or substitution of pork for sheep meat in other countries (Dooley et al. 2004). Furthermore, adulteration includes the introduction of meat unfit for human consumption, such as re-processed chicken sludge or use of dead animals’ meat or inclusion of cartilage or bones, which have been treated to resemble something palatable (Pointing and Teinaz 2004). Even the consumption of adulterated meat with human flesh or other tissues like human placentae has been suspected in recent years. This is because of placentophagy as a newly emerged trend among new mothers in western countries (Donley 2019). Human placenta is served cooked or smoked or even commercially encapsulated dried powder. Its products may contain toxins or carry risks as transmission of diseases or causing allergic reactions (Farr et al. 2018; Donley 2019). Since anything from human origin is not allowed according to Islamic rules (halal practice), thus, the human placenta is not permitted in halal food or meat products (Hashim and Mat Hashim 2013). The introduction of human or any forbidden animals tissues like those of donkey or pigs in meat products is violating the Egyptian red meat production guidelines that allow only red muscle meat of ruminants (e.g. sheep and cattle). Lack of adequate international regulations for the disposal of human placentae in hospitals might encourage food criminals for their use as a cheap meat adulterant (Donley 2019) that might necessitate their detection through DNA-based human-specific markers. Furthermore, unhygienic handling of meat products either processed manually in small markets or semi-automated in larger factories may require tracing the contributing person of that improper processing or handling who violated the national (Egyptian Organization for Standards and Quality 2014; Egyptian Organization for Standards and Quality 2016) and international regulations for sanitary reasons. Skin-infected hands or coughing and sneezing near the area of meat processing or unprotected wounds while working might all aid dissemination of food born infection like Salmonella, E. coli or Staphylococcus aureus (Food and Agriculture Organization 2019). Genetic fingerprinting of human-specific markers can aid personal and even species identification through any human trace evidence like body fluids or tissue cells (Butler 2005; Goodwin et al. 2011) that might be introduced into minced meat. The forensic identification of the animal or human species of processed meat—especially if manually prepared—might be needed in investigating some criminal behaviours involving cannibalism (eating human flesh). Such abnormal activity might be committed mostly for revenge by murderers or for claimed nutritional value and personal preference to human flesh taste in some areas of the world (Marriner 2011). Because of several reasons including food scandals and socio-economic changes, customers are demanding an increase in the detection of meat species and fraudulent labelling in different foods (Cammà et al. 2012) to guarantee fair trade and adherence to relevant legislation (Mafra et al. 2008; Spink and Moyer 2013). Various methods based on analysis of species-specific protein and DNA have been developed to detect meat and meat products coming from different animal species (Che Man et al. 2007) in addition to other chromatographic and spectroscopic techniques (Abbas et al. 2018). PCR represents a highly sensitive test that could detect traces of meat of any species even if cooked, which allows for the detection of an animal species rapidly and reliably. Genomic and mitochondrial genes, such as 12S rRNA, 16S rRNA, cytochrome b gene, and human hypervariable control region (D-loop), have been used frequently for species identification using multiplex PCR (Melton and Holland 2007; Ghovvati et al. 2009). Several eukaryotic genomes include polymorphic markers involving trimeric and tetrameric short tandem repeats (STR). STRs comprise 2–6 nucleotide repeated sequences in a tandem array of 100–400 bp length (short fragments which proved to be human-specific) (Butler 2005). This means they are amenable to PCR amplification so can be used in the analysis of degraded samples or low-quantity DNA less than 1ng (Pizzamiglio et al. 2006). During STR commercial development and validation into multiplexes for human DNA fingerprinting, they have been tested for species specificity on primate and non-primate species. No amplified products were detected for non-primate species like bovine, canine, porcine, poultry and feline species. Abnormal allelic size and number were recorded for primates like chimpanzee and orangutan (Crouse and Schumm 1995; Levedakou et al. 2002). To the authors best of knowledge, those markers have not been tested before for meat authentication and forensic species identification for possible human unhygienic contamination or suspected criminal adulteration. The primary aim of this study was to determine potential adulteration and/or contamination of different marketed meat products with three suspected meat species in the Egyptian market (Upper Egypt). They were chicken, donkey meat or byproducts, and even traces of human tissues or cells. 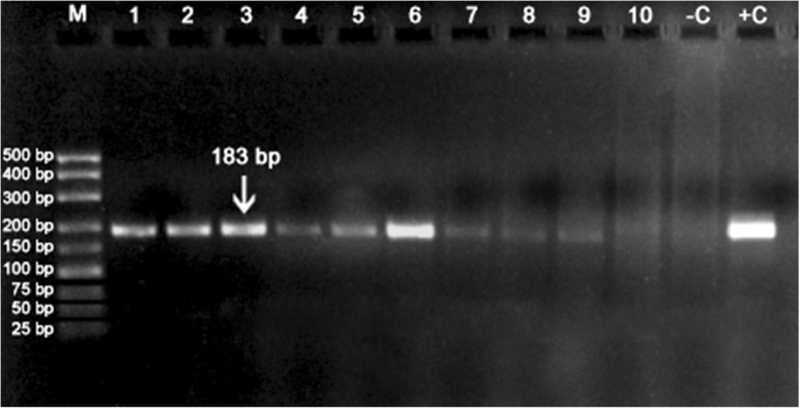 The secondary aim of this study was to examine-for the first time-the use of human- specific STRs for meat authentication through a PCR-based method. 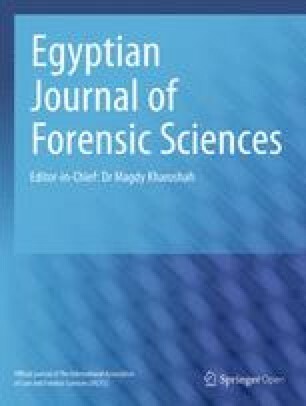 In this experimental study, a total of 40 different commercial beef meat products were randomly collected from restaurants, butchers, hypermarkets and local shops located in various regions in Upper Egypt. Ten samples were partitioned from each product of raw uncooked beef burger, oriental beef sausages, kofta and beef luncheon; either manually prepared or belonged to different commercial brands with variable prices. All samples were labelled and then transported in icebox container to the Meat Hygiene Lab, Faculty of Veterinary Medicine, Assiut University; and stored at − 20 °C for 2 weeks until analysed for meat species identification and possible adulteration (Keyvan et al. 2017). This study was a part of a larger one for meat authentication through various techniques other than PCR. Those were immunological, histomorphological, and biochemical analyses of meat products for the detection of proteins and tissues of different species examined here that will be presented in future publications. The collected, frozen meat product samples were allowed to thaw. Fifty milligrams was collected from multiple sites of each product and was put in 1.5 ml tubes for each sample. Meat DNA was organically extracted by the standard phenol-chloroform-isoamyl alcohol protocol followed by DNA concentration through ethanol precipitation (Elkins 2012). DNA extracts were quantified spectrophotometrically through the NanoDrop ND-1000 spectrophotometer (NanoDrop Technologies, Wilmington, USA). The 12S rRNA region within the mitochondrial DNA was amplified with species-specific primers for identification of two suspected animal species (donkey and chicken) and two STR loci TP0X and D18S51 for excluding human origin of adulteration or contamination. Sequences and references of the primers and amplicon lengths were listed in Table 1. Species-specific PCR optimizations were performed to define the annealing temperatures of primers. PCR reactions were performed in a total of 12.5-μl reaction volume by using BioRad C1000 Thermal Cycler (Hercules, CA, USA) and a ready-made One PCR™HiFi 2× master mix (GeneDirex, Taiwan) according to the manufacturer recommendations but in half quantities. 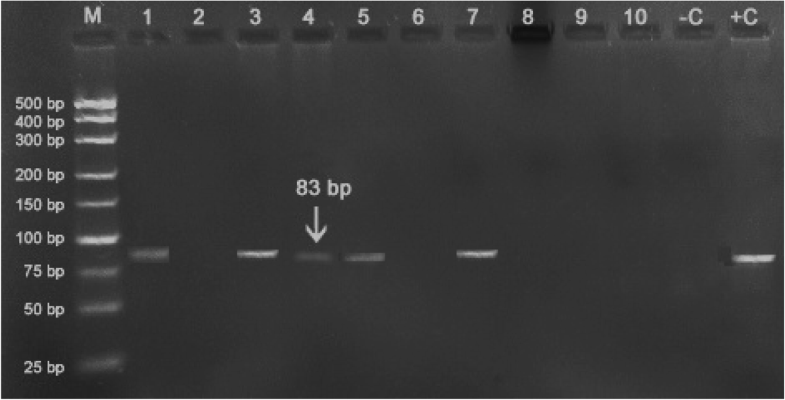 The following PCR reagent combination was performed: 6.25 μl master mix, 0.5 μl of 0.5 μm of each forward and reverse primers, 3.25 μl water and finally 0.5–10 ng DNA in 2 μl volume. PCR cycles were as follows: for donkey and chicken, initial denaturation step at 94 °C for 4 min; 30 cycles of 94 °C for 30 s, annealing at 57 °C for 30 s, extension at 72 °C for 30 s; and a final elongation at 72 °C for 10 min. For human STRs, the amplification conditions were initial denaturation at 95 °C for 5 min, 30 cycles at 95 °C for 45 s, 60 °C for D18S51 or 55 °C for TP0X for 45 s, 72 °C for 45 s and a final extension for 10 min (Findlay et al. 1998). Known positive and negative controls and reagent blanks for each species were concurrently amplified. A human positive control was taken from human placental tissue after appropriate ethical approval obtained from the Faculty of Medicine’s Committee of Medical Ethics, Assiut University, and an informed consent from the donating mother. Visualisation of amplified products was performed by electrophoreses on a 4% agarose gel, 3:1 High-Resolution Grade (BioShop, Canada) at 100 V for 45 min that contained ethidium bromide (AMRESCO, Solon, USA). Five microlitres of PCR products was mixed with 1 μl DNA gel loading dye 6× (Thermo Scientific, USA). The 25–500 bp ladder DNA weight standard (BioASIC, Canada) was used. Gels were photographed, and bands were sized using the BioRad gel documentation system (Hercules, CA, USA). Each meat product labelled as of beef origin examined (burger, sausages, kofta, and luncheon) showed a percentage of mixing with another undeclared species as shown in Table 2. All species tested for raw meat products adulteration were presented in Fig. 1 (chicken), Fig. 2 (donkey) and lastly Fig. 3 for human adulteration and/or contamination. Only one manually processed kofta sample showed adulteration with the three species tested with PCR (chicken, donkey and human), but other meat products were mixed with one or two types of suspected adulterant species. The human origin of kofta sample was investigated later and deduced to have resulted from accidental unprotected wound and escape of blood into minced meat during processing. However, other manually processed products showed no positive reaction for human contribution though. The 40 samples analysed showed 87.5% adulteration and mislabelling with other species. The tested burger, sausages, kofta and luncheon samples were mostly mixed with chicken flesh or remnants (72.5%) followed by donkey (12.5%) and lastly human (2.5%). It is mandatory that the information about the composition of meat products be clearly and honestly declared. Species identification in such products is of considerable importance for their lawful authentication and food hygienic purposes. This study displayed 85% adulteration in processed meat products by one or more of tested species as the chicken, donkey and even human. The used marker 12S rRNA for identification of animal species and STRs as well-established markers for human identification proved successful for detecting meat adulteration or contamination by a human source. A previous study (Zahran and Hagag 2015) was performed on Egyptian meat products labelled as 100% beef, using PCR-RFLP technique, revealed 12% adulteration. Donkey, sheep and goat meat were the main contaminating species in a partial agreement of the current results. Ahmed et al. (2011) detected higher adulteration rate with PCR than gel immunodiffusion method in the beef burger with chicken at 69%, in raw kofta with pork at 45.5% and donkey at 18% in a similar Upper Egyptian locality. Species-specific PCR in another study performed in Suez Canal cities in Egypt (Mosaad 2017) revealed detection of sheep, chicken and equine species in 80%, 50% and 10% in that order of examined oriental sausage samples besides the absence of beef meat in 20% of samples. Beef luncheon specimens were found mixed with chicken in 70% and equine species in 10% of samples. Furthermore, beef burger meat products were mislabelled with chicken species in 100% of samples in addition to 30% adulteration with equine species. Results of that recent study were in line to the present finding though with higher percentages of adulteration. Other international studies were parallel to the present findings as regards chicken and equine adulteration though with varying percentages in oriental sausage samples (Flores-Munguia et al. 2000; Ghovvati et al. 2009; Cawthorn et al. 2013), beef luncheon and beef burger (Flores-Munguia et al. 2000; Cawthorn et al. 2013). The examined processed meat products were reported to be susceptible to fraudulent adulteration for economic profit gained through mixing with cheaper meats like chicken remnants as a partial or total replacement (Soares et al. 2013). Furthermore, morphologic characters of muscles are lost after grinding and mixing, thus concealing the original meat species in processed meat products (Liu et al. 2006). The presence of different animal species in examined products might have resulted from unintentional or accidental comingling one type with another during processing with shared equipment and unhygienic handling (Di Pinto et al. 2015; Keyvan et al. 2017). Whether deliberate especially for those of equine species, which are forbidden in Egyptian food chain according to the Islamic roles, or unintentional adulteration, all will cause meat product mislabelling. This will lead to subsequent potential health hazards or allergy and the inability to freely choose products based on religious and ethical principles (Cawthorn et al. 2013). Even criminal or illegal marketing or mixing with prohibited meat source like human tissues or a biological waste like placentae may be practised without being thoroughly reported (Hayes 2016). Human placenta might be released from hospitals in some countries for pharmaceutical companies to extract hormones or use in cosmetics, but such sporadic policies and absence of standard nation-wide regulations for medicinal use or just disposal as biological waste. This might lead to its use as a processed meat adulterant being minced, and all its macroscopic features disappear especially if prepared manually in local shops (Cremers and Low 2014). The present study has utilised 12S rRNA mitochondrial gene locus for animal meat species identification which proved successful in detecting adulteration in agreement of previous reports (Girish et al. 2005; Melton and Holland 2007). Noteworthy, the authors declared the current work to be the first study addressing the use of human STRs that are mainly implemented in human identification or DNA fingerprinting in forensic practice to be a marker for human adulteration and/or contamination of meat products. During their multiplex development as hypervariable regions with excellent discrimination power among unrelated individuals in different commercial kits (Ensenberger et al. 2010; Wang et al. 2011), they have been tested for species specificity. They were found to be unique in identifying the human origin of any tissue or body fluid containing human nucleated cells even if mixed with those of other non-primate or microbial species (Crouse and Schumm 1995; Sparkes et al. 1996). Hence, we justified their potential use for forensic human species in commercial meat products authentication for possible contamination during manual processing of freshly prepared minced meat products like kofta or burger. Regarding gel electrophoresis of the PCR products (bands or alleles) using the two loci examined (TPOX and D18S51), we meant to detect positive or negative amplification which is human-specific (qualitative). Different alleles and genotypes are polymorphic among persons, which aid added personal identification as well especially when combined with other STR loci used in commercial kits for human DNA fingerprinting (Butler 2005; Goodwin et al. 2011). The relatively low resolution of agarose gel even with a high concentration (4%) did not allow for observation of different alleles for each locus between the sample and the positive control which collectively span 100 bp size range only using current primers, and one base or one repeat difference among alleles. Calvo’s (2002) and Verkaar’s groups (2002) reports were among the scarce studies that examined repetitive DNA markers as satellite tandem repeats to identify species through PCR. Calvo and co-workers proved that the used marker was a powerful technique for the identification of bovine contamination, due to its simplicity, specificity and sensitivity (detection limit of 0.005% raw beef). A somewhat related investigation for the potential involvement of a genomic fragment in introns of the tumour suppressor gene (TP53) in species identification gave a promising result with fragment size diversity among examined animal species and humans as well (Bellis et al. 2003). It has been recognised that for species specificity for any desired species microsatellites (STRs), a given pair of microsatellite primers usually developed specifically for each species and rarely works across broad taxonomic groups (Glenn and Schable 2005). Several STRs systems have now been introduced in forensic practice like those for cattle, cats and dogs for the individual animal identification. All were tested for species specification and proved to be successful in that issue (Coyle 2008; Butler and Reeder 2018). Though species identification was carried out mostly through mitochondrial DNA markers in human and animals, tandemly repetitive markers can be used as well in authentication of different meat products raw or processed and cooked or not with the added value of identification adulterating individual animal or human. Histological and morphologic examination along with quantitative real-time PCR might differentiate possible adulteration from just cross-contamination. This exploratory study investigated the use of STRs for human species identification in processed meat verification, faced some limitations though. Further confirmation and validation for sensitivity and detection limits of used markers may warrant further studies. Different situations of human contribution to processed meat need to be addressed as well. Those instances may involve just touch or handling of meat products, or human body fluid introduction as blood, or even introduction of minced human tissues like the placenta. The study aimed to determine potential adulteration and/or contamination with donkey, chicken or even human tissues or biological fluids in different marketed meat products. Mitochondrial 12S rRNA region for identification of two suspected animal species (donkey and chicken) and two nuclear DNA STRs (short tandem repeats) loci, for excluding human origin of adulteration or contamination, were utilised. The samples analysed showed 85% adulteration and mislabelling with other species. They were mostly mixed with chicken meat or their by-products followed by donkey and lastly a human origin of adulteration or contamination that was detected in a manually prepared kofta sample. The used non-human species-specific PCR along with the first reported use of human hypervariable STRs proved valuable techniques for suspected species fraudulent adulteration or contamination of meat products. Authors would like to thank the director (Prof. Sherine Ahmed Abdel-Rahman) and the lab staff of the Medical Molecular Biology lab, Faculty of Medicine, Assiut University for offering lab facilities and the technical advice. Most data generated during this study are included in this manuscript. Other data that may support the findings of this research are available from the corresponding author on request. GA designed this work and wrote the manuscript. All authors contributed to the study design and literature search. AT carried out the data collection and analysed the data statistically. All authors revised and approved the final manuscript. The study was carried out in accordance with the ethical standards, declarations of Helsinki. Approval was obtained from the Committee of Medical Ethics at the Faculty of Medicine, Assiut University in Upper Egypt (Ref#17300272) prior to the research conduction mainly for collection of human placenta after informed consent. All the information was available for the research team only. All related personal data of the placenta donor will be kept confidential. All data regarding the brand names of commercial companies or markets dealing with the studied meat products will be kept undisclosed.